Halve the tomato and squeeze out the seeds and liquid. Dice the tomato in parts of maximum 1 cm. 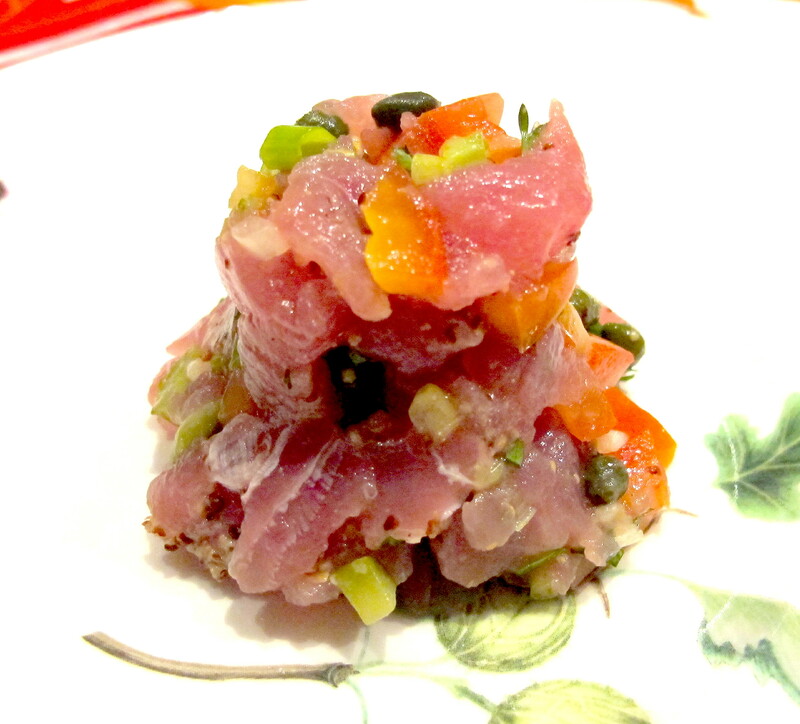 In a salad bowl, put all the ingredients for the “tartare” together and toss gently until everything is nicely spread. Take a small bowl, fill it up with the tartar and push gently with a fork. With a plate cover the bowl and reverse. This should give a nice shape. You can also use a cooking ring. Serve as an entrée with crackers or toasted bread. Maybe less common, but personally I also like to serve this dish as a main dish, or as a lunch, with cold sushi rice. Categories: Nibbles, Starters & Snacks, RecipesTags: ARC, boat recipe, catamaran, cooking on a boat, fishing, Lagoon, Magali, ocean passage, raw fish, tartare, tuna, what to do with fish? Feeling peckish just reading about it! Great Blog Magali! Proficiat!